In the beginning of August, roughly 40 of Civil Rights Defenders’ partners will visit Stockholm to take part in the EuroPride celebrations. Because of their work for the protection of and respect for LGBT rights, the majority of them are forced to operate under direct threats in their home countries, such as in Russia, Belarus and Turkey. 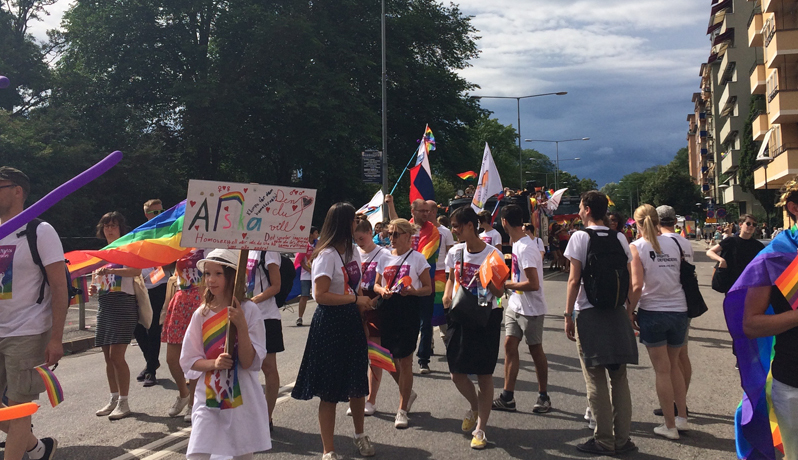 During their stay in Stockholm, they all get the opportunity to network and exchange experiences and knowledge with other LGBT defenders working under the same conditions but in different countries. This year, LGBT defenders from Civil Rights Defenders’ network travel here from Russia, Belarus, Albania, Bosnia and Herzegovina, Macedonia, Montenegro, Kosovo, Serbia and Turkey. Several of the countries, like Russia and Belarus, have adopted repressive laws that forbid the spreading of “gay propaganda” or material that “discredits the institution of the family and marriage”. It is also common that LGBT events such as the St. Petersburg QueerFest are forced to shut down or change venues due to threats and hatred. In other countries, such as in Bosnia and Herzegovina, laws exist that are meant to protect LGBT people against discrimination. However, these are poorly implemented and the legal system often fails to respond to the attacks. “There is a law protecting the LGBT community from discrimination, but the law is not adequately implemented and discrimination is still widespread. Members of the LGBT community in Bosnia and Herzegovina are often physically attacked and discriminated against, and the legal system is both inert and unresponsive,” said one of Civil Rights Defenders’ partners from the Sarajevo Open Centre based in Bosnia and Herzegovina. Come listen to five LGBT activists from Turkey and the Western Balkans telling about their work in environments where the respect for human rights is critical and LGBT activists daily are facing discrimination, threats and persecution. The governments of both Belarus and Russia have embarked on a crackdown on LGBT rights for the past few years, and the environment for human rights defenders has worsened. As a result, LGBT people and activists face increased discrimination, threats and violence in their everyday lives. Similar to the Russian homophobic “gay propaganda” law, Belarus adopted a law that prohibits dissemination of information “that discredits the institution of the family and marriage’’ in 2017. Earlier that year in Chechnya, homosexual men were illegally detained and tortured with almost no prospect of legal redress. This has led to a situation when LGBT activists are facing more obstacles in their work, which also creates fatigue. How do you work in this environment to counter violence and hate speech, and what can you achieve? What strategies can be used to ensure the right to equality? Activists Kseniya Mikhailova and Oleg Rozhkov from Russia and Belarus shares their experiences and knowledge within this field. For more information about the seminars, click here. The annual Pride Parade will be held on 4 August this year. Civil Rights Defenders will be there to march together with our partners from Russia, Albania, Bosnia and Herzegovina, Macedonia, Montenegro, Kosovo, Serbia and Turkey. Would you like to march together with us? Stay updated on our Facebook page.